All new graduates are strongly advised to attend; current graduates are also invited. All periods will be represented, including the archives from the John Johnson Collection of Printed Ephemera and the Conservative Party Archive. The stalls cover British & European history, US history, Latin American history, African and Commonwealth history and East Asia, South Asia and Middle East history. The librarian from the Map Department can introduce you to the historical map collections held in the Bodleian Library but also explain how you can create your own maps. We will also have experts for Legal History, Official Papers, History of Science & Medicine as well as Visual Sources and Printed Ephemera. Talk to college librarians and archivists to discover their rich collections of rare books and archives which might be on your doorstep. We have guest appearances from the History Research Librarian, the Information Skills Librarian, Senate House Library and the librarian from the Institute of Historical Research Library. Representatives of the Bibliography of British and Irish History and Gale Cengage will be present to give you advice about online repositories. If you are interested in Oxfordshire local history, then Oxfordshire History Centre stall will be an important stop. Brookes University Archivists will be visiting, and staff from the Dictionary of National Biography and Houses of Parliament Online. ORA (Oxford Research Archive) staff can advise you on depositing your thesis in Oxford’s online institutional repository. 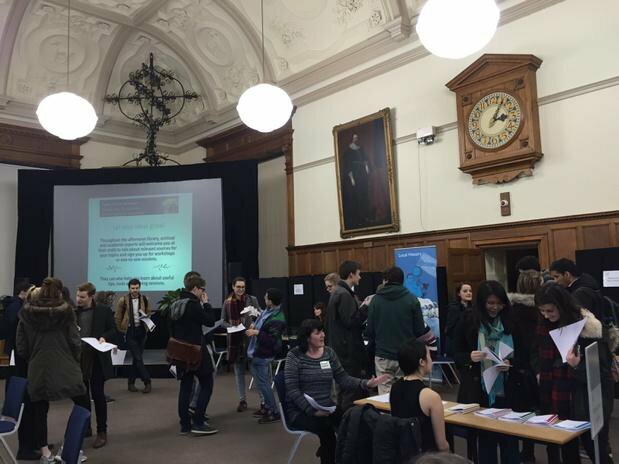 The Top 10 Tips stall will give you an opportunity to meet a current graduate who can share with you their advice. A wide variety of subject areas which students can explore at their leisure throughout the afternoon! Come and meet library staff and take the chance to familiarise yourself with the library at the start of your studies. We will be organising separate tours for new undergraduates and postgraduates during 0th week and beyond. Library staff will take new undergraduates around the Radcliffe Camera showing you where things are located and enabling you to use the library with ease. Treasure Hunts: complete the optional library quiz at the end to be entered into our freshers’ prize draw for a KeepCup! Several KeepCups to be won. Students will need to bring their university card to enter the library. Location: Meet Reception, Radcliffe Camera. Not sure how to find your way round the Bodleian Library, Gladstone Link and History Faculty Library (HFL) and which facilities are available? 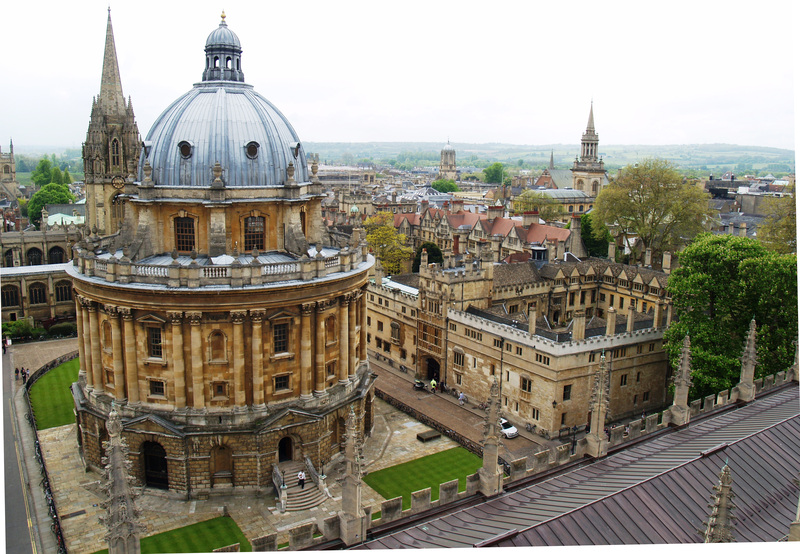 Join the History Librarian for a 60min orientation tour of the central Bodleian Library site, including the Radcliffe Camera where the HFL is located, and briefly enter the Weston Library which is relevant for Special Collections and African & Oriental studies. Treasure Hunts: complete the optional library trail at the end to be entered into our freshers’ prize draw. Not sure how to find your way round the Bodleian Library, Gladstone Link and History Faculty Library (HFL) and which facilities are available? Join the History Librarian for a 60min orientation tour of the central Bodleian Library site, including the Radcliffe Camera where the HFL is located, and briefly enter the recently opened Weston Library which is relevant for Special Collections and African & Oriental studies. These workshops which are run jointly by IT Services and the Bodleian Libraries are open to graduate researchers. More information on Hilary Term training courses for Postgraduates can be found at the History Faculty Library Website. For more information about the selection process visit our StudentZone webpage. 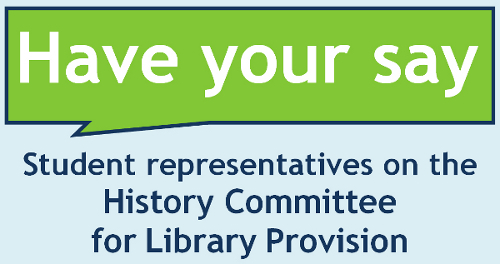 For details about the Committee, including it’s membership, visit our Library Management webpage. The next COLP meeting will be on 12 February 2013. Almost 200 research students attended a free hands-on workshop at IT Services last week. They each tried out a range of tasks with library & IT tools and services to support their research and study. Further sessions for 1st and 2nd year higher degree researchers and students will be running at the start of Hilary Term. Watch a quick video of a workshop on Youtube. If you missed out this term, it’s not too late to book your free place on a January workshop. The Humanities sessions are on Tues 15 and Wed 16 January 2013, 14.00-16.00 and will be held at IT Services, 13 Banbury Road, Oxford. Next week Bodleian Libraries will be running workshops on searching online news sources, finding and manipulating academic e-books and using e-book readers. This session will introduce Oxford’s collection of e-books, helping you not only to successfully locate e-books but also to manipulate them and make the most of their functionality. How useful are e-book readers in academic work? Can they be used for accessing library materials? What are the features to look out for when considering purchase? These and similar questions will be considered with reference to the i-Pad, the Amazon Kindle and Sony Touch e-readers and smart phones. News sources are primary resources for researching contemporary political and social issues. This session will provide an overview of the key resources and hands-on exercises with databases such as Nexis UK, Factiva, and Proquest. Why not follow join our mailing list by sending an empty email to wiser-subscribe@maillist.ox.ac.uk, follow us on Twitter at http://twitter.com/oxwiser or visit the BodWiser blog at http://bodwiser.wordpress.com. If you are not a current member of Oxford University but would like to attend a workshop please contact usered@bodleian.ox.ac.uk. Please quote your Bodleian readers card barcode number. 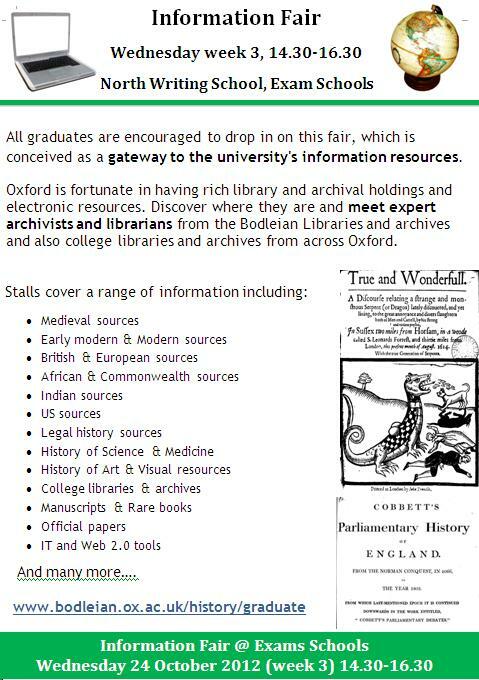 All Oxford University History graduates are encouraged to drop in on this fair, which is conceived as a gateway to the university’s information resources. 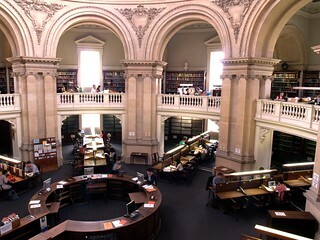 Oxford is fortunate in having rich library and archival holdings and electronic resources. Discover where they are and meet expert archivists and librarians from the Bodleian Libraries and archives and also college libraries and archives from across Oxford. Need to brush up on your IT and information skills? Why not come to a Research Skills Toolkit in 8th week? These free 2 hour workshops introduce key software and online tools for your research, hone your searching and information skills and introduce you to subject specialists. The Research Skills Toolkit is open to postgraduate students at Oxford University only. > Find out more and book ( Oxford university students only, requires Single Sign On).